Recent reading recap. Try saying that fast three times! I love to read and want to make an effort to share a little more about all things reading on the blog. My hubby and I were recently discussing the merits of speed reading. He is excited to try a new speed reading technique he found online. I’m skeptical. For me, part of the enjoyment of reading is savoring the book. Picking it up and putting it down. Seeing what it challenges me to think about in between reading sessions. But the hubby is trying the speed reading thing out and I’m excited to see how it works for him. Okay, onto my recent reads. It’s been a cozy mystery kind of couple weeks. Usually I like to rotate the genre of book I’m reading for a little variety, but it seems to be becoming a summer of cozies for me. Caught Bread Handed by Ellie Alexander. I’ve told you about this series before. It is the one that my sister and I are reading together. A new book in the series came out recently and my wonderful sister pre-ordered it for me. I had a copy on my doorstep on the day it was released. How’s that for sisterly love? My sister, Lisa, and I even participated in a super fun Facebook Launch Party the author hosted and geeked out talking about the series with fellow readers. The book was a quick, fun read. Stay tuned for pictures of the sister tea party Lisa and I plan to throw ourselves where we make recipes from the book. Do you ever have those books that have been sitting on your shelf for awhile and for some reason you just haven’t got around to reading them? 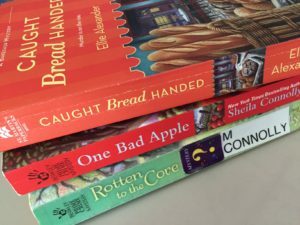 One Bad Apple by Sheila Connolly was that book for me. It is the first book in a series about a 30-something woman who is recently laid off from her Boston job in the financial industry and decides it’s time for a change of pace. This includes restoring an old family property in the New England countryside to get away from city life. Of course, she finds a murdered man on her new property (which includes an apple orchard) and has to get to the bottom of the case while working to restore her century old house. This was a fun read. It was enough to invest me in the characters and check book number two in the series, Rotten to the Core, out from the library. Now the trouble is the third book in the series is checked out and not due back until the end of the month. So I think a little Amazon shopping may be in my future. So there you have it. What I have been reading when I have a free minute during the day or am ready to shut my brain off and wind down for the day. Now the only question that remains is … what to read next?!?! Like you, I like to savor a book. I’m between books right now and can’t decide what to read next. Probably a Carolyn J. Rose Substitute Teacher book. She’s pretty funny. I haven’t read her books yet. I’ll have to give them a try. Funny is always good. Thanks for the suggestion and thanks for stopping by to visit, Marja!